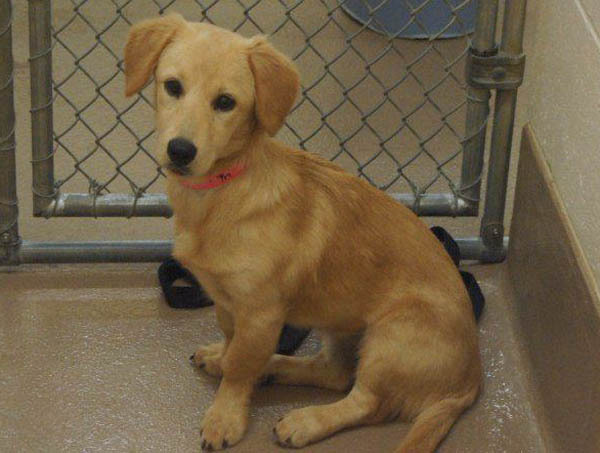 27586 is described as a Nova Scotia Duck Tolling Retriever, which is a relatively rare breed, but I’m more inclined to think this puppy is a mix of something like a Golden Retriever or lab with some kind of low rider like a basset. Whatever her heritage, she’s a beautiful puppy, friendly and playful, and will be available for adoption tomorrow, September 25, 2012, from the Gwinnett County Animal Shelter. 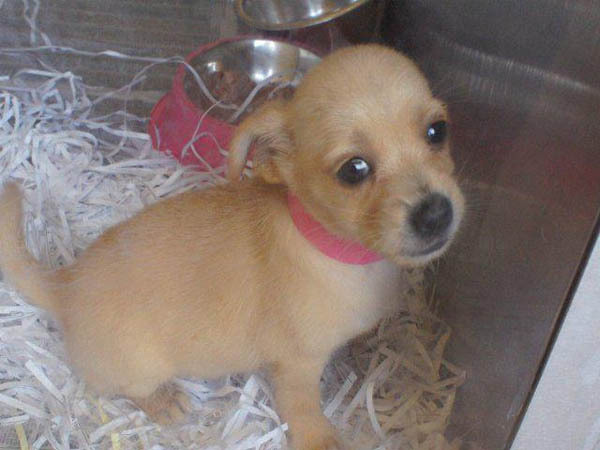 27581 is a pocket puppy, a female Chihuahua, who also is described as friendly and playful and who will be available for adoption beginning tomorrow, September 25, 2012, from the Gwinnett County Animal Shelter. 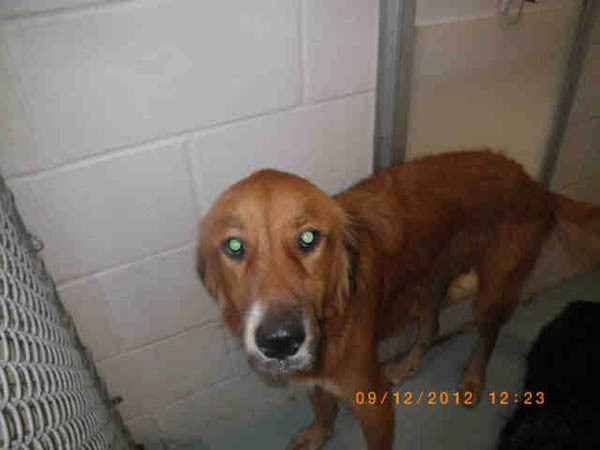 128036 is a male Golden Retriever who has landed in the lockup in Augusta and is available for adoption there. He’d be a great candidate for one of the Golden Retriever Rescues in Atlanta, and if someone wants to transport him, email me and I’ll put you in touch with the great folks of Adopt A Golden Atlanta. 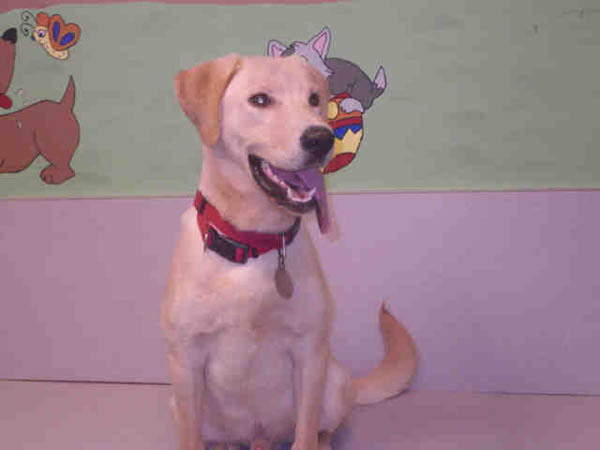 Finally today, we have 125540, nicknamed Johnny, a yellow lab male who’s available for adoption from Augusta Animal Shelter. From the collar and the fact that he has a name, I’d guess he’s an owner turn-in, which typically means no mandatory hold time at the shelter. Republican Public Service Commissioner Chuck Eaton has written an Op-Ed arguing that the cost of solar panels have come down enough that it may now be considered on its own merits, without government mandates or subsidies. The bad name solar energy has in Republican and conservative circles is based on the way it’s been over-hyped and oversold by the left and, in some cases, by those with a financial interest in the technology. In Republican politics, solar energy is synonymous with failed big government policies, in part because of money schemes like Solyndra and taxpayer-subsidized automobiles. I believe that solar technology is not inherently liberal; it’s the way in which it is implemented that marks solar programs as liberal or conservative. With the cost of solar installations falling dramatically, some say as much as 75%, we can now discuss deploying solar power without the subsidies, waste, and cronyism that seems to pervade government solar initiatives. The only way we can responsibly implement more solar power is to require that it does not increase rates, and that solar programs include competitive mechanisms to ensure the lowest cost. As we have seen with the repeal of the sales tax on energy used in manufacturing, which the members of the Public Service Commission supported, and Governor Deal signed into law, lower energy costs not only benefit families, but can help Georgia attract more new jobs. Speaking of government incentives for energy technology, Hall County’s ZF Wind Power is learning what happens when you run out of government money. “The timeline to install new turbines is about six months and so … you can do the math,” said Elizabeth Umberson, president of 1925 New Harvest Drive, off Calvary Church Road. The approaching deadline has had a “chilling” effect on orders, causing them to drop dramatically. The expiring tax credit gives wind manufacturers 2.2 cents for every kilowatt hour produced, said Jennette Gayer of Atlanta-based Environment Georgia. “It assumes that wind (energy) is going to be a little bit more expensive, so to help encourage manufacturers to build turbines and feed into the (electricity) grid, it gives a small incentive per kilowatt hour to do so,” she said. So there we have the perfect contrast: one approach to energy production that relies on competition and one that relies on government mandate and other peoples’ money. Speaking of this year’s repeal of the sales tax on energy used in manufacturing, Gwinnett County is looking at ways to make up for the revenue it “lost” in the repeal. County officials will discuss next week implementing a new tax to replace funds taken away by a state-mandated exemption. The law, adopted by the General Assembly earlier this year in an attempt to create a more business-friendly environment in Georgia and draw jobs, would give manufacturers a break on state and local sales taxes on energy resources, including electricity, natural gas, oil and other types of fuel. A phase out of the taxes will begin next year and be complete in 2016. But to make sure that local governments didn’t suffer from a loss of revenue, legislators agreed to allow counties and cities to impose an excise tax on energy equal to the amount of money lost in local sales taxes, according to information from the Association County Commissioners of Georgia. The association said the excise tax can be used for any purpose, unlike sales taxes, which must be used for capital projects. Today’s theme is voter registration. You can check your voter registration status online with the Secretary of State’s website to confirm that your information is correct. 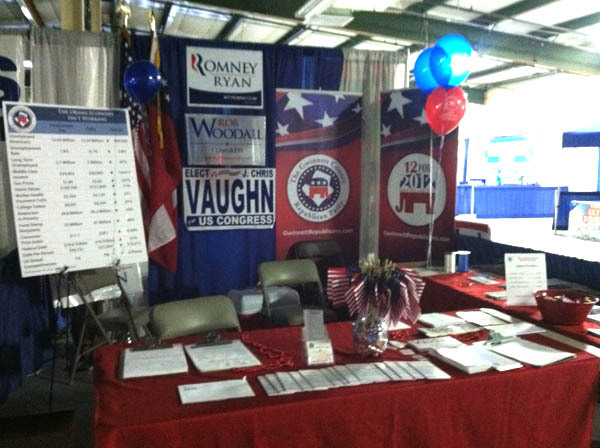 You may also download and print a voter registration form or absentee ballot application to fill out and mail. The deadline to register for the upcoming election is Oct. 9. The Savannah branch of the NAACP is offering rides to the Chatham County Voter Registration Office to obtain authorized identification. 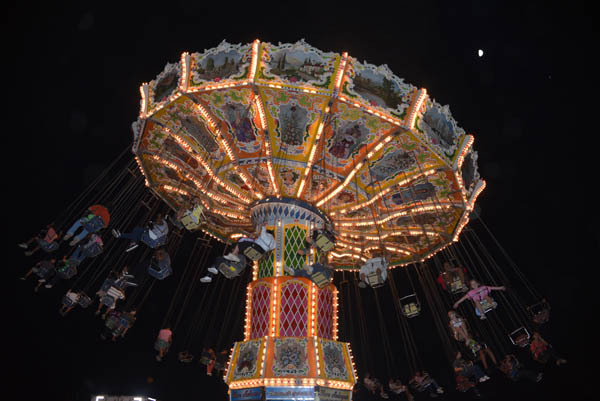 The rides and the IDs are free. No documents are needed to acquire an ID. Call the Savannah branch of the NAACP at 912.233.4161 for more information. Speaking of Gwinnett Republicans, they will be holding a barbecue on Sunday, October 13th at Bethesda Park in Lawrenceville from 11 AM to 2 PM featuring Hal’s Barbecue. Click here for advanced tickets online here. Advance tickets are $12 per person, or $20 per couple. Tickets at the door are $15 per person, or $10 for college students with valid ID. Children under 6 are free. Advance tickets must be paid online in order to receive the discount. Alice O’Lenick has been named to the Gwinnett County Board of Elections as a Republican nominee for the Board. Alice O’Lenick will replace Keith Shewbert, who resigned to run as a candidate for the Norcross City Council. [Gwinnett GOP Chairman Bruce] LeVell said he plans to re-appoint longtime member Joan Zellner upon the expiration of her term at the end of the year. Both major parties have two seats on the elections board, with a fifth independent member chosen by commissioners. O’Lenick, a Dacula resident, has worked as a substitute teacher as well as has many years experience on the financial side of Gwinnett-based companies. Zellner has served on the elections board for nearly 20 years and was co-founder of the Greater Gwinnett Republican Women’s club. Colquitt County Democrats held a voter registration drive featuring some of their candidates this weekend. While the presidential race is always the biggest draw on a ballot, local voters will decide races for Colquitt County sheriff and county commission District 2. They also will cast ballots in races for District 171 state representative, for state Public Service Commission and in a referendum on granting the state more power in establishing charter schools. Historically Black Colleges and Universities (HBCUs) are holding a nationwide HBCU Challenge to increase voter registration among students. Earlier this week, Pennsylvania’s Supreme Court sent the fight over the state’s new voter ID law back to a lower court. A group I’ve never heard of called The Advancement Project has released a report saying that the requirement for voter ID and other barriers to illegal voting may prevent up to ten million eligible Hispanic voters from exercising their right to vote. In an analysis based on government data, civil rights group The Advancement Project identified legal barriers that could deter voter registration and participation among eligible Hispanics. In some of those states, the group’s researchers said, the number of voter-eligible Latino citizens potentially blocked by those barriers exceeds the margin of victory in the 2008 election. “Like African Americans, Latinos have experienced decreased access and correspondingly lower levels of voter registration and participation than non-Hispanic whites,” said the report, which was being released Monday. According to census data, there were more than 21 million Hispanics of voting age in 2010. They comprised roughly 10 percent of all eligible voters and 8 percent of registered voters in the U.S. Among eligible Hispanics in 2010, 6.3 million said they were not registered to vote, and 10.8 million — about half of those of voting age — said they did not vote, the report said. By comparison, the report said, there were 172.4 million non-Hispanic white citizens eligible to vote in 2010, with nearly 18 percent unregistered and 38 percent who said they did not vote. There are three significant barriers to Hispanic voter participation, researchers said: citizenship-based voter purges, proof of citizenship requirements and photo identification laws. A report by the Secretary of State’s office indicates that Northwest Georgia (also called “Extreme Northwest Georgia” by some denizens) has lost more than 10,000 registered voters since the 2008 election, and the state voter rolls have grown by only 6,517 people. A total of 226,560 voters were registered in Floyd, Bartow, Chattooga, Polk, Gordon, Walker, Catoosa and Dade counties as of Sept. 1, according to Georgia secretary of state records. That’s 10,209 fewer than the 236,769 who registered for the 2008 election. Georgia has 5,205,488 people on its rolls, compared to 5,198,971 registered, eligible voters four years ago. Anyone who voted in the July 31 primary is good to go, but Floyd County Elections Supervisor Evon Billups said would-be voters who didn’t cast a ballot in the 2008 or 2010 elections should check their status. “And if you are registered but you’ve changed your address, you have to update that in order to get the correct ballot,” she said. A name-change also must be registered, since a picture ID is required to vote. The AJC reports that more than 36,000 newly registered voters have been added to the rolls betwen August 1st and September 1st of this year. County election officials said interest is high since both political parties held their nominating conventions around Labor Day, with many predicting a registration surge into next month. Georgians have until Oct. 9 to register to vote in the general election, although the first ballots went out Friday to voters casting absentee ballots by mail. Many groups, partisan and nonpartisan, will press to get people’s attention over the next two weeks. Secretary of State Brian Kemp, like his peers nationwide, has declared September National Voter Registration Month to encourage participation and increase awareness of state requirements and deadlines for voting. And although it will come too late for November, Kemp plans next year to enable online voter registration. According to the National Association of Secretaries of State, despite record-breaking registration and voter turnout in many states for the 2008 presidential election, six million potential voters did not cast a ballot because they missed a registration deadline or did not know how to register. In an OpEd published in the Columbus Ledger-Enquirer, Chris Johnson makes the case for trimming the voter rolls of not just people who lack the legal right, but those too stupid or otherwise impaired to vote. • If you have watched more than five minutes of “Here Comes Honey Boo Boo,” then you aren’t allowed to vote. • If you rail against “Here Comes Honey Boo Boo” but have seen most of the shows, you’re a hypocrite, which means you aren’t allowed to vote but are surely qualified to run for office. • If you have ever been featured in an episode of “Here Comes Honey Boo Boo,” you’re not allowed to vote … or procreate. • If more than half your backside is showing outside the top of your pants, then you’re not allowed to vote – not that it has anything to do with the political process, but I don’t want to stand behind you in line. • If you know the name of any droids other than R2D2 and C3PO in the “Star Wars” movie franchise, you aren’t allowed to vote but are allowed to work on my computer. Carroll County will add a second early voting location for the November election. Voters will have three weeks to cast early ballots in the election, with extended hours during the final week. In addition to the Carrollton site at the elections office on College Street for the entire three-week period, advance voting will also be held during the final week at the Powell Park Arts Center in Villa Rica. “We added the Villa Rica advance voting site to help voters in the northern part of the county,” said county Elections Supervisor Becky Deese. Advance voting begins Monday, Oct. 15. During the first two weeks, voting will be held only at the Carroll County Elections Office in Carrollton, from 8:30 a.m. to 4:30 p.m. each weekday. 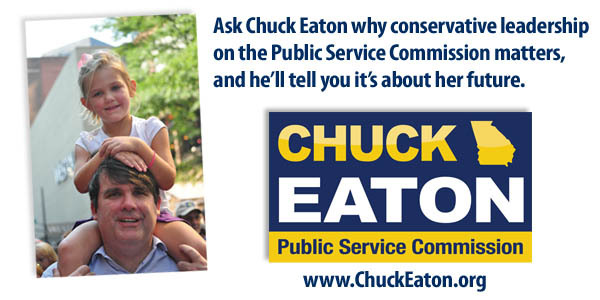 The Saturday voting day will be Oct. 27 from 9 a.m. to 4 p.m. at the Carrollton office only. During the final week of advance voting, Oct. 29 through Nov. 2, advance voting will be held at both the Carrollton and the Villa Rica sites, from 8:30 a.m. to 6 p.m. The Powell Park Arts Center is at 424 Leslie Drive in Villa Rica. Deese said the state now uses the term “advance voting” for all early voting instead of the previously used “early voting” designation. Eligible Carroll County voters will also have an opportunity to vote in the Special Election to fill former Senator Bill Hamrick’s seat. With Carroll County voters representing aroung 55% of votes cast in the last two elections for Hamrick’s seat, the additional early voting site may help a Carroll County candidate force Republican Bill Hembree into a runoff. Governor Nathan Deal has appointed State Rep. Christian Coomer (R-Cartersville) as one of his Floor Leaders, replacing State Rep. Doug Collins, who will be elected to Congress in November. Despite enacting extreme budget cuts forcing average public school class sizes to grow by substantial numbers, despite underfunding the state’s obligation for “adequate” public education, the typical response by Georgia’s top politicians to our state’s education problems has been “Let them have choice!” Political leaders, including Gov. Nathan Deal, want to divert dwindling resources from neighborhood public schools to help corporate interests privatize education in our state. The Gold Dome crowd wants Georgia voters to believe charter schools, operated by for-profit companies, will be the magic bullet for improving education. That, despite numerous studies showing charter schools perform no better than other schools in improving educational achievement. Like most issues embraced in our state Capitol, it’s all about money. To be specific, it’s about one of the Capitol crowd’s favorite pastimes, opening taxpayers’ wallets to private business interests. Even if we had the money to afford to set up charter schools across our state, that leaves one important unanswered question: What happens to those kids in our community who don’t get into a charter school and are left in the even more woefully underfunded older public schools? Gov. Deal and his pals have their answer: Send them to the cafeteria and let them eat cake. The congressional office of Rep. Tom Graves (R-Upper Left Hand Corner) was burglarized last week but the Congressman’s hair remained perfect. The items taken from Graves’ office were two laptop computers. Reports state someone kicked in the door to the office to get inside. Cooke said there’s no evidence the thieves were solely targeting the congressman. “U.S. Capitol Police, along with local authorities, are investigating the incident,” Graves spokeswoman Jennifer Hazelton said in a statement. The National Federation of Independent Businesses (NFIB) has endorsed the reeleciton of Democrat John Barrow to Congress from the Twelfth District. Barrow’s opponent, Republican Lee Anderson will have some high-profile help, as House Speaker John Boehner will visit the district to boost Anderson’s campaign. Anderson made the announcement at Saturday’s GOP breakfast at Fatz Cafe in Evans. “Oct. 15th, we will have the speaker here,” Anderson said. In remarks to a group of about 30 people, Anderson continued to question why his Democratic opponent will not publicly declare that he is voting for President Obama in November. Democrat Lesli Messinger has no chance at all of unseating Republican Congressman Jack Kingston. The GOP vote in the new 1st, according to figures from the legislature, averaged 58 percent in 2010 statewide contests. Just two Democrats, gubernatorial nominee Gov. Roy Barnes and attorney general nominee Ken Hodges, broke 40 percent. Justifiably, we hear a lot about how new boundaries work against incumbent Democrat John Barrow in the neighboring 12th District. Indeed, statewide Republican candidates also averaged 58 percent there in 2010. So Barrow, who carried the old district with 56 percent of the vote in 2010, is correctly viewed as vulnerable. So picture the plight of a novice Democratic candidate running on turf with similar 2010 election results. And against a veteran GOP incumbent who’d banked $1.24 million as of mid year. At least Barrow has the good political sense to distance himself from President Barack Obama, a political albatross in Georgia. In contrast, Messinger boldly supports him. Can you say kamikaze run? Also having zero chance of being elected are the two people running against Republican Congressman Phil Gingrey in the new Eleventh District. Chatham County District Attorney Larry Chisholm will open his campaign office tonight at 6:30 PM. Jasper County School Board member Pamela Williams took the local Democratic Party to task for attempting to control the way elected officials vote once in office. Williams has represented District 8, which includes Hardeeville, for nearly four years. In August, after a correction, the county election commission said Williams actually lives in District 9, the Levy precinct. She said she approached County Council because she was asked to attend a meeting of the Democratic Party of Jasper County in the spring by Alex Pinckney, president of the Democratic Club. She said after preliminary introductions, Democratic Party chairman Arthur Murphy and Pinckney put her candidacy in no uncertain terms. “I informed them that I was highly insulted, for them to even suggest this,” said Williams, who is the wife of a county magistrate judge. Williams said she questions the Democratic Party’s motives with the school board and the correction of her district, suggesting that the correction seems to be a way for the Democratic Party and the school board to get rid of candidates. Murphy denied that anyone in the party told Williams how to vote as a school board member. Cherokee County voters can attend two informational forums about the Homestead Option Sales Tax on the November 6th Ballot. The first educational forum will begin at 8 a.m. Tuesday [September 26th] at the Northside Hospital-Cherokee Conference Center. Another forum is slated for 6 p.m. Oct. 4 at the Chambers at City Center in Woodstock. Both forums are sponsored by Cherokee Bank and the Cherokee Tribune. “The HOST Referendum is difficult to understand for the average voter. There is no better experience than to hear an informative presentation and have an opportunity to ask questions,” said Dennis Burnette, Cherokee Bank president. It’s actually not hard to understand. We have the HOST in DeKalb County. The voters will have an opportunity to levy an additional penny sales tax, the proceeds of which will be used to offset part of the property tax bill for county operations. It works very well in DeKalb, limiting both our property tax bills, and generally speaking, the rate of growth of county government. The HOST is expected to generate about $30 million per year, of which 20 percent can go for capital expenditures, according to the law structuring the tax; however, the commission plans to approve a resolution that would dedicate the entire amount of the revenue toward a property tax rollback. There are two questions regarding the matter on the ballot: One asks if the HOST should be imposed and the other asks if up to 100 percent of the proceeds should go straight to reducing property taxes. Bridget Mary McCormack teaches at the University of Michigan Law School and is running for her state’s Supreme Court. She also has a web video that gathered most of the liberals cast of The West Wing to discuss the issue of voters choosing a party’s straight ticket and neglecting to vote for nonpartisan judicial offices. Pretty cool for $5000, assuming she doesn’t have to disclose the in-kind contributions of the actors at their day rate. In honor of “Black Friday” at the Gwinnett County Animal Shelter, where all black or majority-black dogs and cats can be adopted for $30, a saving of $60, here’s your song of the day. 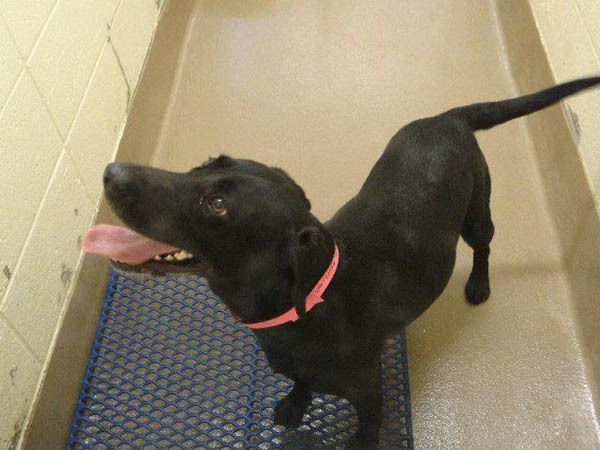 27459, a female lab, is one of the dogs who is eligible for the discount. Rally is a Shepherd puppy from Walton County Animal Shelter whom we featured for several days. He was rescued by Pound Puppies ‘n Kitties, and we encourage you to consider donating to support their work saving dogs. Rasmussen released a poll that indicates that 64% of Americans believe that too many people rely on government aid. The latest Rasmussen Reports national telephone survey finds that 64% of Adults think there are too many Americans dependent on the government for financial aid. Just 10% think not enough Americans are dependent on the government, while 16% say the level of dependency is about right. Even most of those who say they are currently living in poverty (56%) feel there are too many Americans dependent on government financial help. There are sharp partisan differences over this question, however. Eighty-nine percent (89%) of Republicans and 61% of those not affiliated with either of the major parties believe too many Americans are dependent on the government for financial help. But just 40% of Democrats agree. One-in-three adults (33%) in President Obama’s party believe the level of dependency in America today is about right. Among all Americans, 34% rate government programs designed to help people get out of poverty as effective, while 59% say those programs are not effective. This includes just four percent (4%) who think government anti-poverty programs are Very Effective and 20% who feel they are Not At All Effective. Only 13% of those currently in poverty consider the government programs effective, compared to 36% of those who are not poor. Forty-nine percent (49%) of all Americans believe current government anti-poverty programs actually increase the level of poverty in the country. Only 20% think the programs reduce poverty, while just as many (20%) feel they have no impact. So maybe it’s the mainstream media who are out of touch with Americans, not Mitt Romney. Who would have thought? The Marietta Daily Journal opines that Romney should continue his discussion of taxes and entitlements. It’s the difference between the “hand up” philosophy of conservatives and the “hand out” philosophy espoused by many liberals. To his credit, Romney, as of this writing, has not backed off his remarks. Yes, it surfaced at an unfortunate (for him) time, as he and others were sharply criticizing the incumbent for his incompetent, bungled Middle East policy. But successful candidates play the hand that is dealt them and find ways to trump unfavorable circumstances. And that is what Romney must now do. The candidate must keep hammering home the fact that Obama has driven the country off the fiscal cliff. He must remind people at every opportunity of Obama’s redistributionist policies and efforts to transform the United States from a free-people, free-market capitalist country into a government-centered entitlement society — an effort that probably has a tax-cutter like JFK spinning in his grave. Romney is on the right track, as his comments Tuesday on Fox News showed. Last night, Governor Nathan Deal took to the stage at a Gwinnett County Republican Party rally and spoke about Romney’s comments. Deal said Romney’s recent comments about a growing percentage of Americans relying on government programs, with a shrinking group of those paying taxes, echoed concerns of political philosophers when this country was created. Senate Majority Leader Chip Rogers defended his acceptance of reimbursements for expenses paid by his campaign through his lawyer, Doug Chalmers. “They were not campaign mailings, they were constituent mailings and had nothing to do with his election or re-election,” Chalmers said, who was hired by Rogers last week. “It was proper for him to be reimbursed because he had loaned his campaign tens of thousands of dollars which were used to make these expenses in first place. There will be no double dipping—it’s perfectly legal,” Chalmers said. Chalmers said Rogers has already taken steps to correct the matter. “Even to avoid an appearance of impropriety, when the issue was brought to his attention, he cut a personal check to his campaign for $8,500,” Chalmers said. But William Perry, executive director of Common Cause Georgia, said in an interview with the Tribune that Rogers could still face possible consequences. 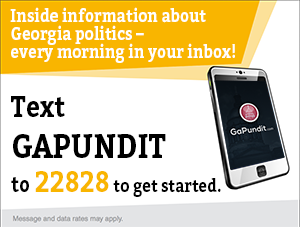 Georgia law prohibits using taxpayer money to pay for campaign costs. Lawmakers can use state funding for newsletters and other printed materials intended to keep constituents informed about issues, which Chalmers said the funds were used for. Perry said he did not think anyone was out to steal money, but because of lack of oversight, politicians become careless. It is permissible for a campaign to pay for expenses incurred in the elected official’s performance of his or her duties. (OCGA §21-5-33(a)). Speaking of political direct mail, NPR has a story this morning about the barrage of direct mail that will start filling your mailboxes any day. In the coming weeks, candidates will bombard your mailboxes with ads. It may seem old-fashioned, but the consultants who devise direct-mail campaigns have become sophisticated about knowing whom to reach and what to say. “It’s almost because of the changing media landscape that direct mail remains relevant,” says Anil Mammen, who runs a small direct-mail shop in Washington, D.C.
Mammen says direct mail is an ideal medium for negative ads. People are more inclined to believe what they read. Campaigns are spending about 15 percent of their ad budgets on direct mail, says Kantar Media/CMAG, a campaign-ad tracking firm. “Political campaigns can use the mountains of available data, demographic, psychographic data about, you know, who people are, what their gender is, what their occupations are, as well as things like what magazines they subscribe to or whether they have children or a pet at home or whether they have a gold [credit] card,” Panagopoulos says. Like taxes, direct mail isn’t going away anytime soon. This year, campaigns are expected, Panagopoulos says, to spend more than $1 billion to get their messages delivered to your door. I received the first mailpiece of the General Election two days ago from J. Max Davis, the first Mayor of Brookhaven, who will be elected in the November 6th General Election, though some city council posts will have to be filled in runoff elections. Professor Alan Abramowitz (D-Emory) says that increasing polarization of the electorate decreases the advantage of incumbency, leading him to tweak his presidential prediction model, which tightens his predicted margin in favor of Barack Obama. A Georgia business is making national news with its signs in opposition to President Obama’s reelection. Businesses take a big chance by outing their politics, says Costas Panagopoulos, a political science professor at New York’s Fordham University. “They need to weigh the risks against the potential benefits of making such a visible expression of their preferences,” he says. But the owner of one Georgia business says response to his political missives has been mostly supportive. At Premier Platforms Inc., which sells, rents and services various kinds of aerial platforms and forklifts, David Cooper uses his giant highway marquee to broadcast his politics. He’s no fan of President Obama, as anyone driving along Interstate 75 near Byron, Ga., could tell: “Things could be worse. Re-elect Obama — he’ll prove it,” one recent message read, according to Macon newspaper The Telegraph. Cooper told the newspaper he could “count on two hands the number of complaints” he’s gotten; one person threatened to picket the business, but the threat never materialized. Real Housewives of Campaign 2012? Sounds like a blockbuster reality show. See, just like our casts, these characters are hyper-competitive and more than willing to have it out in front of a worldwide audience. It’s like, “Who cares what they’re saying about us — as long as they’re talking about us! Consequences, be damned!” I mean, have you SEEN Romney’s secret video where he badmouths 47 percent of Americans? With those loose lips, it’s no wonder his ship is sinking! Each has questioned the other’s credentials (along with jokes and jabs of birtherism and felony tax fraud) so often, that if you take out Wolf Blitzer and a debate stage and insert Andy Cohen and a “Watch What Happens Live” set, the drama is not as different, as you’d think. By the way, Andy, I can’t wait for the post-election reunion special. The ratings will be HUGE! Former Speaker of the House Glenn Richardson was interviewed on a local Paulding County website, in which he suggests moving away from Georgia’s antiquated and uncivilized system of foreclosure sales literally on the steps of county courthouses, and into a process that allows homeowners being foreclosed upon a day in court. Given what we know about systematic fraud by foreclosing banks, wrongful foreclosures, robo-signing, and the impact of a foreclosure on families, I might support such a measure, and certainly think we should consider moving away from the status quo. Samuel Westmoreland, the director of the Fulton County elections and voter registration office was jailed for ten days after his probation was revoked for failure to complete DUI school and community service, which were conditions of his probation for a 2009 DUI. The elections board is scheduled to take up the matter at a specially called meeting that Matarazzo said is scheduled for noon Monday. Westmoreland already was under fire from voters and election board members for an array of errors that occurred during the July primaries. The missteps included the elections department assigning 690 voters in Sandy Springs and southeast Atlanta to the wrong state Senate and state House races. It also missed the deadline to certify election results by an hour and a half, leaving the county subject to fines by the state Election Board. Former Governor Sonny Perdue joined the Governors’ Council at the Bipartisan Policy Center, which seeks to bring a state perspective to national issues. In Augusta, Lori Davis, a former candidate for Mayor, has endorsed Stanley Hawes for City Commission District One. Former State Rep. Burke Day (R) has applied for an appointment to the Tybee Island City Council to fill the term of council member Frank Schuman who died in office. Dockworkers unions have agreed to extend the deadline for negotiating a new contract with employers at East coast ports. “I am pleased to announce that at the close of today’s productive negotiation session, in which progress was made on several important subjects, the parties have agreed to extend the collective bargaining agreement due to expire on September 30 for a 90-day period, (taking it) through Dec. 29,” said George H. Cohen, director of the Federal Mediation and Conciliation Service. Environmentalists think that Georgia should deploy more wind turbines for power generation off the Georgia coast, but Governor Deal disagrees. Unlike 11 of the other coastal states, Georgia hasn’t joined the Atlantic States Offshore Wind Consortium, a federal program designed to coordinate and streamline wind development off the Atlantic coast. South Carolina and Florida are the only other hold outs. But Georgia Gov. Nathan Deal’s spokesman Brian Robinson indicated via email that the governor is not inclined to support wind energy development now. “When the markets and the technology advance further, we believe there will be a day when wind energy is a viable option for our state,” he wrote. “Georgia will start using wind energy when the prices are right and the technology is right for the unique nature of our wind energy off the coast. Gov. Deal is correct. As we have seen with solar power, states that adopted utility scale solar power generation paid 3-4 times the current cost for photovoltaic cells, which generate electricity. Today, states considering implementing solar will benefit from dramatic cost reductions brought about through market forces, not goverment subsidies. Plant Vogtle’s Unit 1 nuclear reactor is offline this week as it’s being refueled, a process that occurs roughly every 18 months. Steel plates that reinforce concrete construction at the new reactors being built at Vogtle failed safety testing by the Nuclear Regulatory Commission and have not been installed. A more detailed investigation to determine the extent of the problem – and any potential effect on the project – will be completed by Nov. 6, the report said. The inspectors and officials from Shaw Group, the company hired to build the $14 billion project, identified the issues before any plates had been installed, an NRC spokesman said. In an Aug. 31 interview, Buzz Miller, the executive vice president of nuclear development for Georgia Power and Southern Nuclear, told The Augusta Chronicle that as many as 150 additional workers could be needed to bolster oversight programs that ensure materials meet strict nuclear standards. In its most recent report to the Georgia Public Service Commission, the company said final projected costs for quality assurance, oversight, operational readiness and regulatory compliance rose from a projected $621 million in 2009 to $755 million in 2012. A World War 2-era B-17 bomber called “Memphis Belle” is receiving maintenance at Cherokee County Regional Airport until it continues its tour on Monday, but you can visit the plane until then and it will remain based at Cherokee for the next year. At this morning’s Gwinnett County Republican Party breakfast, the Greater Gwinnett Republican Women held a straw poll on the T-SPLOST. The results were 40 people voting against the tax increase and 7 for. No word on whether the pro-TSPLOST speaker voted.